Warangal - 506 004, India. Machine Learning, Pattern Recognition, Algorithms, High Performance Computing, Soft Computing, Outlier Analysis. Fund sanctioned by NIT-Warangal : so far Rs.80.0 lakhs out of proposed Rs.1.0 crore. 1. One day workshop on "Big Data Analytics" conducted with C-DAC, Bangalore at Bangalore on 15-Feb-2014. 2. ABCD-2014 - TEQIP-II sponsored A Five day workshop on Architecture, Algorithms, Analytics for Big Data using Cloud and Distributed Computing - a joint programme with C-DAC, Pune during 7-11 March, 2014. Research : Currently, 6 M.Tech. students and 2 Ph.D. scholars are working in the areas of Big Data Analytics. A Fuzzy Data Mining Algorithm for Incremental Mining of Quantitative Sequential Patterns. Vol.5, No.3, September, 2006, pp.243-257. International Journal of Intelligent Systems Technologies and Applications, Inderscience Publishers. Mining Interesting Infrequent Itemsets from Very Large Data based on MapReduce Framework. Efficiently Maintaining and Discovering Sequential Patterns with Sequence Deletion using Discovered Sequences. vol. 11, no. 1, (2016), pp. 685-691. MSP: Multiple Sub-graph Query Processing using Structure Based Graph Partitioning Strategy and MapReduce. Map-Reduce based Multiple Sub-Graph Enumeration Using Dominating-Set Graph Partition. A Novel Bit Vector Product algorithm for Mining Frequent Itemsets from Large Datasets using MapReduce Framework. DOI 10.1007/s10586-017-1249-x , September, 2017. A Novel MapReduce Algorithm for Distributed Mining of Sequential Patterns Using Co-occurrence Information. Mining Co-location Patterns from Distributed Spatial Data. Mining Behavioural Patterns from Spatial Data. Engineering Science and Technology. Elsevier. A Raster Data Framework based on Distributed Heterogeneous Cluster. Some studies on Frequent and Interesting Infrequent Itemsets: Centralized and Distributed Approaches. Organizing Chair, 4th International Conference on Big Data Analytics by NIT Warangal at Golconda Hotel, Hyderabad during 15-18 December, 2015. Organizing Chair, 6th International Conf. on Big Data Analytics to be organized by NIT Warangal during 18-21 December, 2018 at Warangal. Organizing Chair, National Conference on Recent Advances on Modelling Expert Systems (RAMES) at NIT Warangal to be organized during 26-28 June, 2018. Member, Organizing Committee, 23rd Indian Engineering Congress, December 11-14, 2008 organized by The Institution of Engineers (India), Kolkata. Member, Organizing Committee, 10th Joint Review Mission of TEQIP funds in our country, January 19-23, 2009 organized by National Project Implementation Unit, New Delhi. Nominated as Administrative Officer for EMC2 programmes in NIT Warangal and will be attending EAA Meet at Bangalore on 09-3-09. (ii) International Conference on Enterprise Information Systems and Web Technologies, organized from 13-16 July, 2009 in Orlando Florida, USA. Program committee member in Compute 2010, Bangalore. Member, Publicity Committee, 5th International Conf. on Big Data Analytics by IIIT Hyderabad during 12-15 December, 2017. Reviewer for some international level conferences. June 23- July 5, 2008. Data Warehousing & OLAP Tools- A 5-day Faculty Development Programme TEQIP sponsored . Database Management Systems-a two-week workshop organized at NIT Warangal by IIT Bombay (Prof DB Phatak, Prof S Sudarshan) under NMEICT project, MHRD, Govt. of India. Graph and Geometric Algorithms- 3-day Research Promotion Workshop with Prof Subir K Ghosh and others from Tata Institute of Fundamental Research (TIFR), Mumbai with funds from NBHM at NIT, Warangal. Fundamentals of Databases -NKN based FDP organized and it is delivered through NKN simultaneously at IIT Guwahati, IIT Roorkee, IIITD Jabalpur, NIT Patna, MNIT Jaipur, NIT Warangal. Participant nominated by the institute to receive training for two weeks in Global Education Center, Infosys Campus, Mysore organized by Indo-US Collaboration for Engineering Education (IUCEE), 2008. Participant nominated by the institute to receive training for one week in Global Education Center, Infosys Campus, Mysore organized by Indo-US Collaboration for Engineering Education (IUCEE), 2009. Attended Information Storage & Management Course offered by EMC Corporation, Bangalore from August 18-22, 2008. Participated in an International Conference & Symposium on Storage Technologies organized jointly by EMC Corporation & NMAMIT on 3-4 December, 2008. Attended EAA Meet of EMC Corporation at RVCE, Bangalore on 9-3-2009. Attended Coordinators Workshop on DBMS at IIT Bombay during 19-23 October, 2011. Participated in SAP Academic Alliance Meet on 16-03-2012 at SAP Ltd., Bangalore. Attended International Conf. on Big Data Analytics organized by University of Delhi with the support from IIT Delhi during 24-26 December, 2012. Attended IBM Faculty Residency Programme on Big Data Analytics at IBM Bangalore during 18-20 June, 2014. Associated Member, The Institution of Engineers (India). Hon. 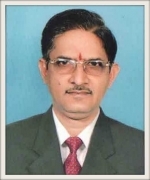 Secretary for The Institution of Engineers (India) for sessions 2012-2014. Countries visited: Cambridge - UK, Dubai. DATA MINING course sanctioned through EOI Project as part of A National Mission Project through ICT (Developing Suitable Pedagogical Methods for various classes, intellectual calibers and research in e-Learning). MHRD, Govt. of India with IIT, Kharagpur as coordinating institute. DATA WAREHOUSING course sanctioned through EOI Project as part of A National Mission Project through ICT (Developing Suitable Pedagogical Methods for various classes, intellectual calibers and research in e-Learning). Conferences: Organized 4th International Conference on Big Data Analytics at Hyderabad. Training : 1. One day workshop on "Big Data Analytics" conducted with C-DAC, Bangalore at Bangalore on 15-Feb-2014. Research : Currently, 6 M.Tech students and 3 Ph.D. scholars are working on some problems in the areas of Big Data Analytics. Head, Department of Computer Science & Engineering from 4-1-2018 . Head, Computer Center from 10-11-2016 . Co-Chief Investigator, E&ICT Academy from 26-4-2016. Institute Level Coordinator, Committee for monitoring Visvesvaraya Ph.D. scheme at NIT Warangal from 2015. Coordinator, Mini Center of excellence for Big Data from 2013. Technical committee member for NIMCET-2014 (Agartala), 2015 (Agartala), 2016 (Durgapur), 2017 (Durgapur). Additional Secretary, NIMCET-2013 (A National level MCA Entrance Test) Organizing committee. Member, NIMCET-2012 (A National level MCA Entrance Test) Organizing committee. CSE department Coordinator for TEQIP-II project. (2009 onwards). Member in institute level committees such as Euphrates, NMEICT, .. Coordinator, TEQIP-II sponsored Finishing School for Circuit Branches - 2014. Member, Internet, Networking, Telecom Maintenance Committee. (consisting of 3 members). Warden, International Students Hall of Residence (2009-2012). BOS in-charge, CSE department (2009 onwards).